Arsenal have launched an investigation into a video posted on social media which a supporter can be heard aiming racist abuse at Napoli defender Kalidou Koulibaly. The video was posted on Snapchat during Thursday night's 2-0 Europa League quarter-final win, in which Senegal international Koulibaly played the full 90 minutes. The culprit can be heard using the N-word to refer to the Napoli defender, with the word also written across the screen for part of the 15-second recording. An Arsenal statement declared: "We utterly condemn use of this type of racist language and have launched an investigation to identify the culprit. The incident comes just four months after Koulibaly was subjected to monkey chants by Inter Milan supporters. Nor is it the first time Arsenal have conduced an investigation into the actions of their supporters this season; Crystal Palace star Wilf Zaha was also the subject of racist abuse and death threats on social media earlier this term following a match between the sides. Arsenal take on Napoli again next week, in the second leg of their last eight clash. 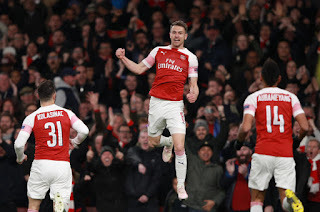 They head to the Stadio San Paolo with a two-goal lead to defend, after first-half goals from Aaron Ramsey and Lucas Torreira. The incident occurred on a night of shame for English football, with Chelsea barring three of their own supporters from entering Slavia Prague's stadium after pre-game 'bomber' chants against Mohamed Salah. The trio were identified by the club's security staff after a video, apparently filmed by the fans themselves, was broadcast on social media on Thursday. A Blues statement on the matter said: "Chelsea FC finds all forms of discriminatory behaviour abhorrent and where there is clear evidence of Chelsea season ticket holders or members involved in such behaviour, we will take the strongest possible action against them.